Our Eyewear Consultants are highly trained and ready to assist you with selecting the right frame and lenses for your personal and professional lifestyle needs. We take the time to discuss how different lens selections and frame styles will impact your vision. 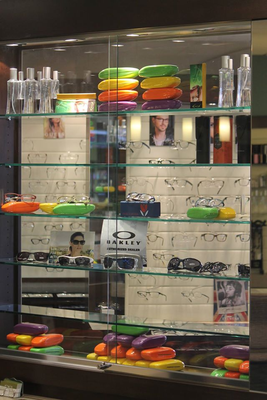 We carry designer frames, funky new fashions and old standards…. something for everyone. Our contact lens technicians can take the confusion out of which lenses are right for your lifestyle. Multi-focal, toric, dailies, monthly lenses, colors and RGP's….let us help you discover your personal favorites. We welcome new clients and all our current patients to visit us with their current prescription. Just drop by, no need for an appointment and let us help you 'see' the new you! We are a Google Glass Preferred Provider. Google Glass, a titanium-framed wearable computer, allows the wearer to perform numerous functions on the go!